I know some of these are cheaper to get off ebay than to try to pull one from a pack. Which one is the easiest? Last edited by priestc; 07-16-2015 at 02:45 PM. Hank Aaron was the auto in 1991 UD high series. Roger Clemens had autos in 1992 Fleer. These were the easiest for me to pull, I pulled 2. 1992 UD high series was Bench/Morgan. Last edited by rats60; 06-30-2015 at 12:58 AM. i think 92 ultra had a tony gwynn sig insert didnt it? How many of these do you think are left? I pulled a '92 Fleer Clemens auto in front of all my friends on my 13th birthday. Still one of the greatest moments of my life! I believe there were 3500 of them. Don't know how many are left, but I guess we can account for three of them here Will post a scan later. I collect sets. All of them. The 91 Score Yaz/Mantle/Musial would be amazing. I was a huge Knoblauch fan growing up and bought the 1992 Score buyback off eBay about a year ago (my white whale when I was a kid). There were 3000 and I don't see them on eBay often (I have a saved search) so I'm sure there are some still sitting in packs. This is a cool list, I didn't even know about some of these (like the 91 Killebrew). Of the ones listed I think the best odds are the 91 UD because there were 4 auto's the three together then singles of each so 10k autos in the boxes. I remember reading at time almost one per case/ 2 cases ??. So you can get the thrill you are looking for by finding a sealed case that should cost less than $100 good luck. I pulled a Klesko from 95 Score. that was something at the time. Now can be found for probably $5-10. Depending on how current you wanted to come, 95 UD had a 5 autograph set (Clemens, Mays, Mondesi, F. Robinson and one more escaping my memory now). 54T Archives had the Gold Aaron RC reprint auto and 95 Brooklyn Archives had the Koufax RC auto. 94 UD Heroes also had Mantle, Seaver and Brett. Then there are some cool minor league autos like the Classic Mike Schmidt, I think Ryan had one too, Gary Sheffield, Barry Bonds, Cliff Floyd, Carlos Delgado, etc. I pulled a 1992 Score Chuck Knoblauch signed in a gold sharpie. I had never heard of a insert card before that or just didnt pay much attention. and got nothing. I have a box of 1992 and 1994 UD on the way. Next up is Score 1992, and then 1991 UD series 1 and 2. The 91 Killebrew/Jenkins/Perry I don't know much about. Its listed in the Beckett, but I can't find any information about what kind of packs they were inserted into.I actually think they weren't put into packs, but I'm not sure. Ditto on the Brock/Blue/Fingers in 1992. The 1991 Upper Deck Heroes packs have Killebrew, Gaylord Perry and Ferguson Jenkins autos (along with Ryan). The 1992 Upper Deck Heroes packs have Vida Blue, Brock and Fingers autos (along with Williams). The Heroes packs are different from the regular packs and are harder to find. They say "Heroes" in a small banner on the front of the box and packs, whereas the regular ones don't. Frank Thomas autos are in 1993 Leaf Series 1, 2 and 3. Eck is in 1993 Ultra Series 1 and 2. Glavine is in 1993 Fleer 1 and 2. There are also 1991 Donruss Canadian boxes Series 1 and 2 with Sandberg autos. There are also 1992 Pacific Ryan packs with Ryan autos and 1992 Pacific Seaver packs with Seaver autos. Also, does anyone know if the 1993 Ted Williams packs had the Williams Locklear auto inserted? Those packs definitely had Juan Gonzalez (all packs) and Brooks Robinson (only in retail jumbo) autos inserted. There is a Leon Day auto inserted into 1994 Ted Williams baseball packs as well. There also is a Ted Williams auto inserted into packs of 1994 Ted Williams football. tradingcardcommunity on reddit - http://www.reddit.com/r/tradingcardcommunity/ <- JOIN AND POST! Last edited by sportscardtheory; 11-08-2018 at 01:02 PM. 1994 Fleer Ultra has Darren Daulton and John Kruk autos. Each signed 1,000 cards, so 2,000 total. They signed the first 10 cards of the Phillies Finest insert set. I'm looking to get one of each of the cards they signed so if anyone has any let me know. 94 Fleer Tim Salmon to wrap up the Fleer run of signed single player insert sets. I went back and purchased many of those previously listed at one point or another. Some good stuff before autographs became dime a dozen. I thought there were more players who signed for those early 90s donruss elite autos. It would be cool to pull one. I actually pulled a non signed elite a couple of years ago from some box that contained a bunch of junk era packs and one pre 1980 pack. Mine ended up being a 75 topps mini. 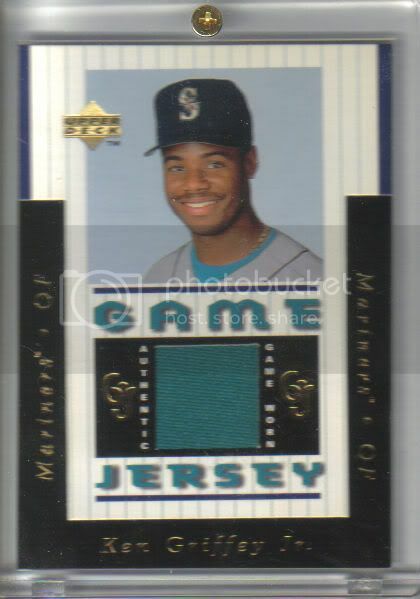 Does anyone know what the earliest jersey/relic card was? Which set/year? I want to say 1997 UD. 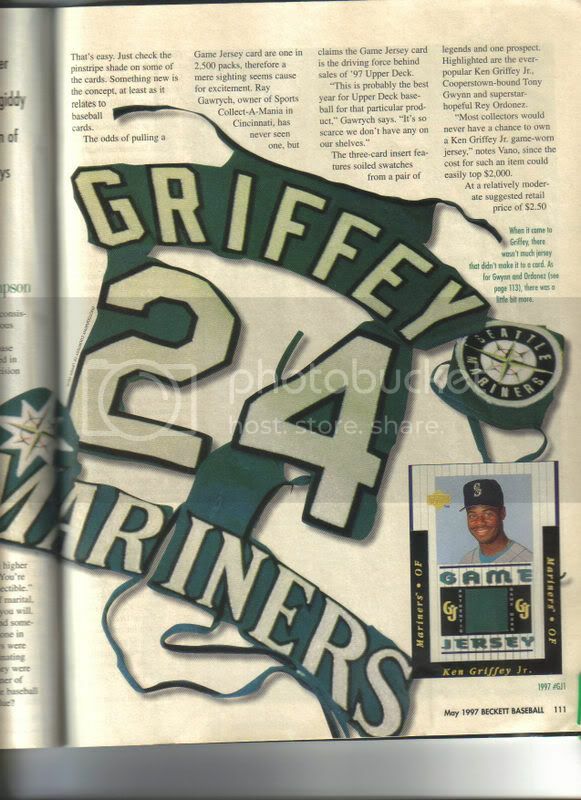 If I remember correctly, it was a 3 card set with Gwynn, Griffey and maybe Ordonez. The design was reused later on as well. I guess I was thinking baseball only. 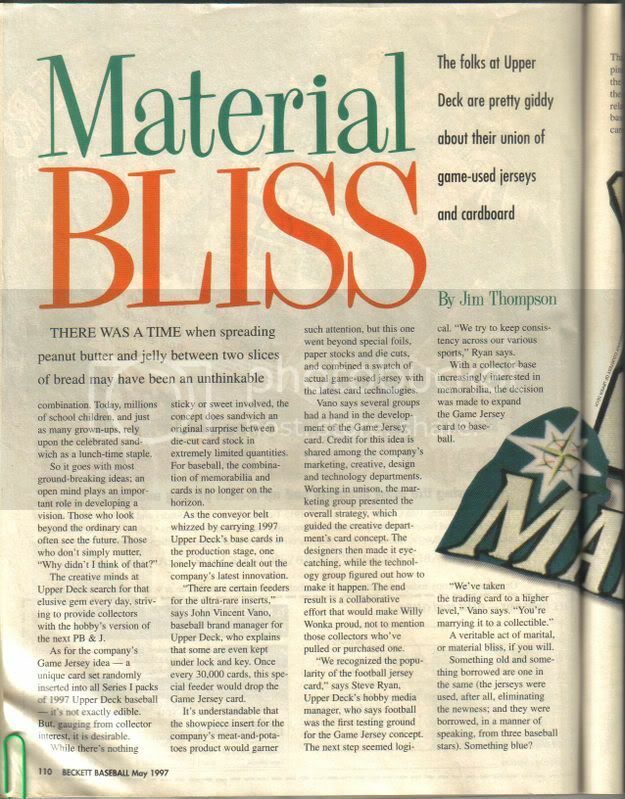 Seems UD did football before baseball and turns out Press Pass did it first with racing materials. Last edited by mrmopar; 11-13-2018 at 10:00 PM. I want to say 1997 UD. 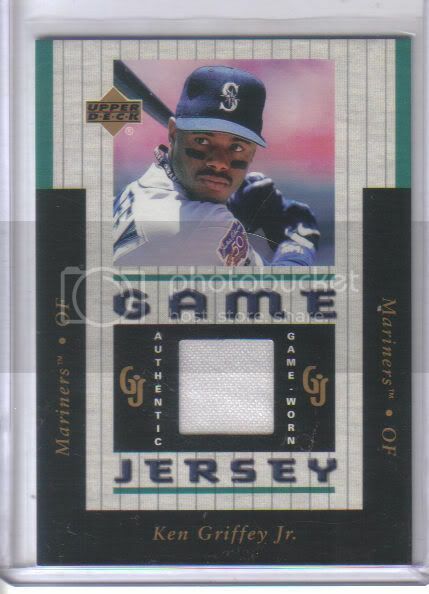 If I remember correctly, it was a 3 card set with Gwynn, Griffey and maybe Ordonez. The design was reused later on as well. 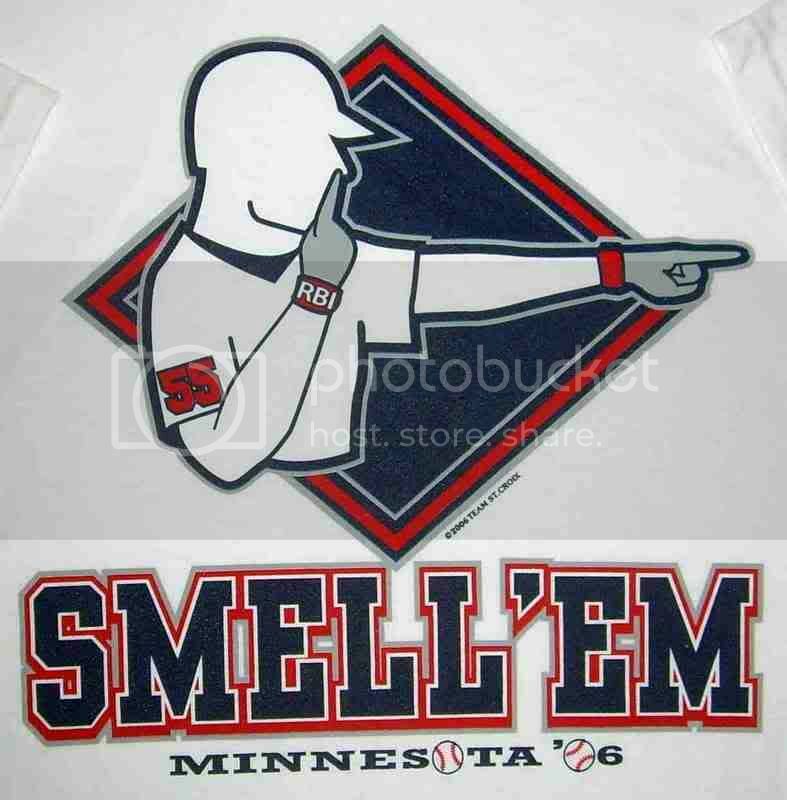 Did anyone ever touch the jersey patch and sniff it, hoping to feel some of the game action embedded in the fibers? I know...that sounds kind of sad. I pulled a 1992 Upper Deck Bench/Morgan auto in 1992. Still have it somewhere unknown. That is the set I was speaking of, for sure.